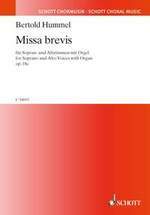 Bertold Hummel (1925 - 2002) composed the first version of the Missa brevis in 1957 while employed as director of music in the parish of St. Konrad in Freiburg/Breisgau to provide suitable literature for church services for those Sundays when the choir was somewhat depleted in numbers. Initially the composition was scored for precentor, unison choir, the congregation and organ (Op. 18b). This current extended version Op. 18c for soprano, alto and organ was created in 1975 for the girls' choir of the Cathedral of Würzburg. The unadorned cantabile vocal lines are complemented by the gently flowing organ accompaniment to produce a harmonically charming tonal texture. The ordinary of the Mass, Kyrie and Agnus Dei, have a tripartite structure and are composed canonically. The initially ascending vocal lines lend the Kyrie a floating character. In the Gloria, the music is divided between schola and choir, although the melodic motifs of both groups repeat themselves. The recitation of the text stands particularly in the foreground with the result that this section of the composition is very much orientated to the clarity of the text and linguistic rhythms. The Sanctus and Benedictus are based on two thematic concepts: one section with lines progressing stepwise is contrasted with a passage containing triadic motifs. The great popularity of the Mass with both listeners and performing choirs has been generated by the singableness of the work and the intuition on the part of the composer for the texts of the ordinary of the Mass. The current new edition provides a meticulously edited and clearly laid out score of the work. This setting of the Mass is suitable for children's and youth choirs as a surmountable introduction to part singing.